If you have the data on either of these two fish, please post here in the comments. 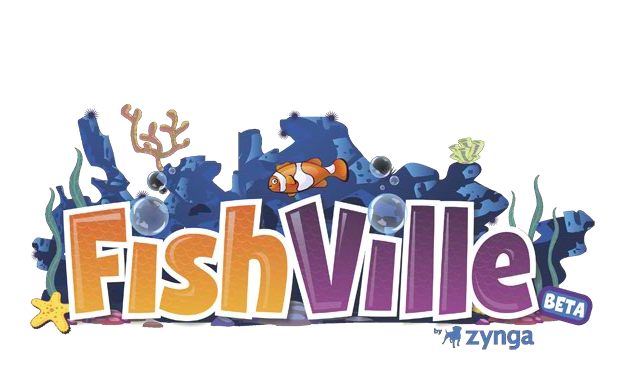 In the past few weeks, Zynga has rolled out a number of new fish. I’ve updated my Google Doc with all the updated numbers. The most interesting addition has been a series of fish that you can only purchase with Sand Dollars, which is the Fishville denomination for game money that you have to buy with real money. According to this table, the ratio of coins to sand dollars varies between 300 and 287, and in a non-linear fashion. It’s as if Zynga didn’t compare the volume discount on coins to the volume discount to sand dollars when they generated these prices. Since it’s non-linear, I decided to take the “average” ratio as my conversion. So, for the purposes of this blog post, one sand dollar = 292.75 coins. What you’ll notice is that some of the “sand dollar” fish are actually money losers for the first two levels. That’s right, assuming my conversion ratio, you’d be better off just buying coins with your money, rather than buying sand dollars and then growing these fish! You can reference the full data in my Google Doc. Let me know if you see any issues with the calculations. For reference, I’ll include the Level 1 tables here, just in case there are issues reading the now huge Google Doc. Whoops. Fixed it in the Google doc. Will update the tables here. 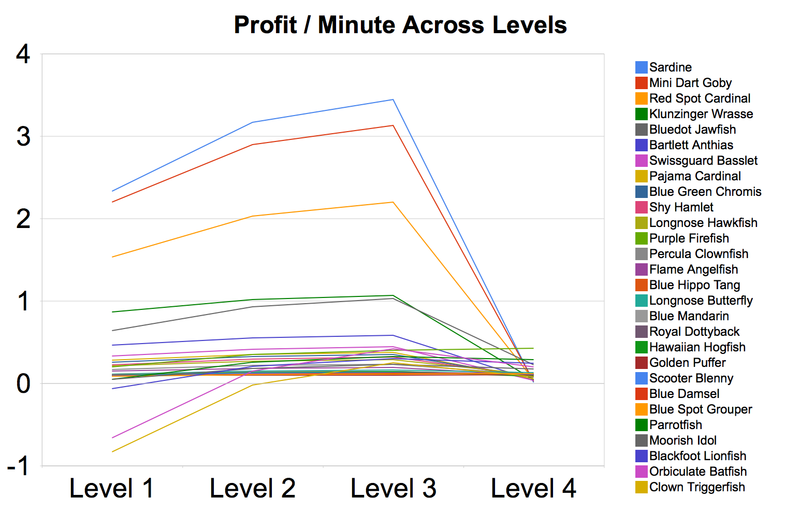 It would be great if you split the graphs between fast-fish, 12 hours or shorter growth rate, and those over 12 hours. this leveling guide is only for those who want to pay little LESS attention to fishville and at the same time gain good amounts of XP.. Thanks again for compiling all of this useful info. Zynga’s been changing things up again. The Swissguard Basslet used to be a one hour fish, now it’s a one day fish! What I have noticed is that level 4 time is just 4 x the level 1 time. 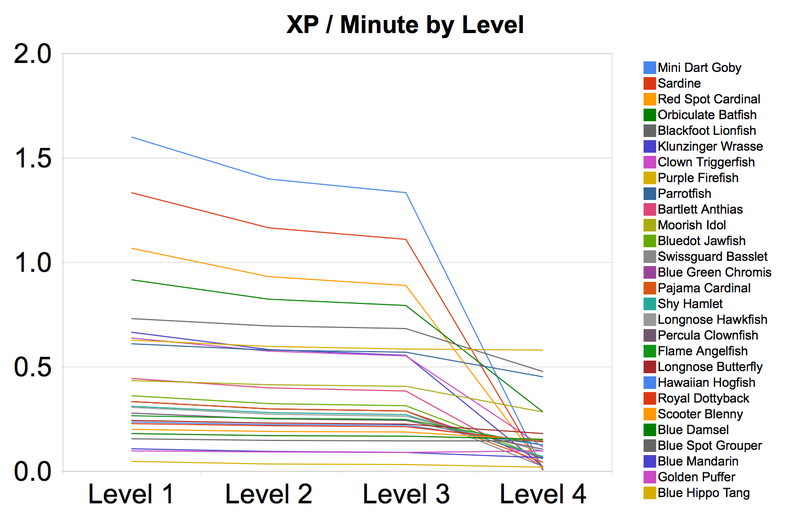 There is no more gain in XP for subsequent levels. i still dont understand wats the confusion about level 4 so much?